Swiss ski resorts have posted up to 1m (40 inches) of snow in the past 24 hours (at the village of Bellwald) as heavy snowfall hits the Alps. The snowfall, which is very widespread across Austria, France, Italy and Switzerland started falling in some areas on Tuesday but is expected to be at its heaviest today, and in some areas tomorrow. A number of resorts in each country were expected to receive as much as (and in a few cases more than) a metre of snow and these projections appear to be materialising. Engelberg, which will stay open to the end of May and already had the world's deepest base at 6.3 metres (21 feet) was forecast to get 65cm over the next few days and reported 40cm in the last 24 hours whilst increasing its upper slope base depth to 6.7 metres (22.3 feet). Its lower slope base depth had been 15cm but this has increased to 35cm reflecting a smaller snowfall at lower elevations – but still snow not rain. The resort is pictured above this morning. 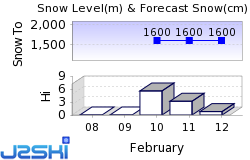 Andermatt, forecast to get 90cm of snow by the end of tomorrow posted 65cm of snow in the past 24 hours. It has posted a 6m (20 foot) upper slope base depth for most of this year regardless of snowfall/thawing and continues to do so. Its total forecast snow is now 105cm. "Much of the fresh and wind-drifted snow represent the main danger. Numerous natural avalanches are to be expected, even very large ones. Avalanches can in isolated cases be triggered in the old snowpack. This applies in particular on north facing slopes. In the typical avalanche paths avalanches can reach a long way and endanger transportation routes that are exposed. The conditions are dangerous for backcountry touring outside marked and open pistes." A slightly low level 3 ("considerable") risk applies to other parts of the country with less fresh snow. Big snowfall numbers are expected to start coming in from ski areas in other countries later this morning. Ski Hire Shops in Bellwald.